The prequel to Dracula, inspired by notes and texts left behind by the author of the classic novel, Dracul is a supernatural thriller that reveals not only Dracula’s true origins but Bram Stoker’s—and the tale of the enigmatic woman who connects them. A sickly child, Bram spent his early days bedridden in his parents' Dublin home, tended to by his caretaker, a young woman named Ellen Crone. When a string of strange deaths occur in a nearby town, Bram and his sister Matilda detect a pattern of bizarre behavior by Ellen—a mystery that deepens chillingly until Ellen vanishes suddenly from their lives. Years later, Matilda returns from studying in Paris to tell Bram the news that she has seen Ellen—and that the nightmare they've thought long ended is only beginning. 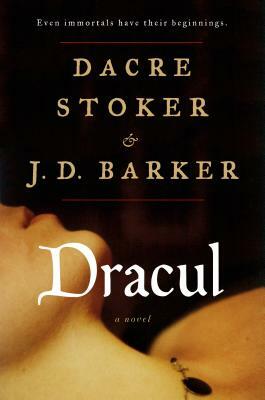 Dacre Stoker is the great-grandnephew of Bram Stoker and the international bestselling co-author of Dracula: The Un-Dead, the official Stoker family-endorsed sequel to Dracula. He is also the co-editor of The Lost Journal of Bram Stoker: The Dublin Years. He currently lives with his wife, Jenne, in Aiken, South Carolina, where he manages the Bram Stoker Estate. J.D. Barker is the internationally bestselling author of Forsaken, The Fourth Monkey, and The Fifth to Die. He was a finalist for the Bram Stoker Award for Superior Achievement in a First Novel, and winner of the New Apple Medalist Award. His works have been translated into numerous languages and optioned for both film and television. Barker currently resides in Pennsylvania with his wife, Dayna, and daughter, Ember.